The main differences between the two are appearance, longevity, and maintenance. The way a film forming deck stain works is basically like the name suggests, it forms a film or barrier of protection that stays on top of the wood surface. Film forming stains are normally semi-solid to solid stains that come in a wide array of colors. They mostly hide the wood grain and show a lot more color almost like a paint. The downside with film forming stains is the way they wear over time. As the wood stain begins to age and breaks down it literally begins to crack, flake, or peel off of the wood. Film forming wood stains are typically more heavily pigmented than penetrating stains making them much tougher to get rid of once a recoat is necessary. Not being able to remove an old coat means applying a new coat over top. Although the wood surface may look better initially following a recoat in this manner, it doesn’t tend to last as long because this type of deck stain doesn’t adhere well to itself. Over time, the buildup of multiple coats begins to create more frequent peeling and flaking, mold and mildew issues, and a nearly irreversible mess. With penetrating deck stains longevity is normally better and future maintenance is much easier and less expensive. Penetrating wood stains don’t sit on top of the wood surface like film forming stains but rather penetrates or dives into the wood pores to give superb protection. Penetrating deck stains are excellent water repellants and do a good job of blocking harmful sun rays. They are usually transparent or semi-transparent allowing the natural beauty of the wood to show through and are available in different colors or tones. a penetrating wood deck stain ages and begins to wear it does not peel or flake but instead, it just fades and begins to disappear. They are also normally much easier to remove using a deck stain stripper so a recoat can be applied. In the case of using the same penetrating stain for a recoat, you can even do a light wash to the wood without removing the old stain before applying a new coat of the same penetrating stain. This recoat over an old coat of stain is much more effective with penetrating stains than with the film forming type. When choosing a deck stain type it isn’t hard to see a clear winner. As far as a more natural enhanced wood appearance, longevity, and ease of future maintenance – penetrating deck stains are best. Our Middle Tennessee home was finished in 2015 a covered deck and lightly stained with a water based BEHR product the same year via spray gun. In Feb 2018 a covered deck addition was added and we are ready to stain the entire structure. A few Questions: We are leaning towards TWP100 (awaiting color samples to test color and adhesion). Will this oil based stain have any problems soaking into the previous very light coat already existing? Can you suggest any other penetrating stains that are equivalent or better quality? Given the entire structure is covered how important is dry weather? We have curtains up and outdoor carpet over the majority of the deck. Should these be removed well in advance or just the day before? It is a double deck structure and we plan to stain the posts, under deck and joists. Any considerations for the under deck? Is there any truth to decoding the wood stamp on the lumber to get information about the wood? Thanks! You cannot TWP or any brand over the Behr. You must remove that first by stripping and or sanding. Brighten the wood after. Look at Armstrong Clark stain as well. The deck has to be dry when you do the staining with these brands. Stamps on the wood mean nothing. No reason to stain the underside of the floor. I’m a new homeowner with a deck that is in need of staining- bare wood. I found a big sale on Cabot solid oil stain for synthetic decks. I have a natural wood deck and didn’t realize the mistake until I was home. Can I use this stain on a wood deck. I am not sure but to be safe, best to return it. Our “home owner association” says I need to match their “approved color” which is a dark brown stain. Can penetrating stains be tinted? I want to use the “best” stain possible. We want to put a wood oil finish on our 1 year old lake dock and are looking at Behr and Livos brands. I do not want to use a stain as the maintenance is always a concern so have been researching wood oils and think that this might be a good option. I need the name of a high end one that will be available in Canada. There isn’t any in Canada at local stores. You will need to order from the states. Try TWP 200 Series. Olympic Summit Woodland Oil. Is this not an oil based product that works similar to TWP or Cutek albeit cheaper quality? According to Olympic the Summit version is the same as the Elite Woodland Oil. I seen it was recommended and Cutek being the top choice on an article on this site. Sorry, but we have never recommended Cutek or Elite Woodland Oil as top choices. They are average stains in our opinion. Let us know how it works for you if you choose one. Great ideas on this website-thanks! I’m looking to stain my red cedar deck that I finished building last fall. I didn’t have a window to stain it before the rain came, so this summer it has been prepped and pressure washed and looks like new again. I’m ready to stain and see that so many brands have lousy reviews. TWP ships to Canada now, but apparently only the 200 series. Ideally a transparent penetrating oil with cedar tint is what I’m looking for. Do you know if the 200 series is acrylic, and if so, am I setting myself up for disappointment by ordering online? They don’t ship samples unfortunately. Question is, how and where would one get a comparable product in Canadian (Vancouver Island) stores? The TWP 200 is oil based. No idea if you can find a comparable product there. Doubt it from the feedback we have gotten from other Canadians. This seems to have good reviews? Behr penetrating oil? Thoughts? Behr has never proven to make a quality deck stain. This one has drying issues (stays sticky) and can turn black with dirt and mildew. I have a deck that surrounds a above ground pool that was built last summer using pressure treated wood. This spring I used the deck cleaner that home depot recommended I use before I used Behr penetrating oil wood finish. It is now 1 month later and water beads in some areas but over all water is not beading on the deck. Should I apply an additional coat of the penetrating oil wood finish, should I just leave it be, or, should I try a different product? Strip it off next Spring and go with a better product. Behr has horrible reviews. I applied Behr penetrating oil deck stain to my deck. After 5 days it is still wet. No tacky, Wet! I spoke to a Behr technical expert who told me the deck should have been dry in 72 hours. I’ve seen on line where this product is still not dry for weeks. The Behr technical expert suggested I pick up mineral spirits to remove their product. Great, then what? The Home Depot paint experts told me this was between me and Behr. My advice is don’t buy Behr and don’t shop at Home Depot. Hi, I have a three year old pressure treated deck. I’ve been using Thompson’s WaterSeal waterproofer plus tinted wood protector in desert brown. I love the color and the visability of the wood grain but each summer I have to recoat the deck boards. The deck is in full sun, gets a winter full of snow, and I have two dogs. The upright parts seem to hold their color not too badly but the parts we walk on completely fade away. What do you recommend? Also, I have heard of “oiling” decks, could you explain what that is and how it looks ? To fix this you would need to sand off the Thompsons and remove it fully. No other brand can go on top of this product. Once fully removed, you can use a penetrating oil based stain. TWP or Armstrong Clark are what we use. We have three dogs that at times leave muddy footprints on our deck. When it rains, we would hope the prints would wash off. The last stain we used did not wash off. Any dirt would stick or absorb into the stain. What is the best transparent stain that seals also? Try Defy Extreme Wood stains. An older dock on a freshwater lake will be pressure cleaned and some dock boards will be replaced with new boards. I’ve been told by some that I should NOT use pressure treated pine new boards as semi-transparent stain will not penetrate pt lumber. Is that correct? You can use PTP wood. Just let it weather for 3 months and prep correctly with a deck cleaner and a wood brightener. I’ve read several dozen articles on different websites in researching the best stain for a new red cedar deck. I’ve been to local specialty stores that frankly they weren’t that helpful. They weren’t pushing any particular product but seemed to know less than I do about the products they sell and ideal products considering the information below. Deckstainhelp.com has been more help than other sources but looking for expert suggestions. I thought I’d settled on TWP and then Sikkens Semi Transparent Cetol SRD but now I’m less certain. I understand TWP is a great product but their pigments don’t match our needs. Based on the following information, I’m interested in recommendations. – Pigmented semi transparent stain. Need a wider range of pigment options since my wife has pretty particular ideas for colors. -2 years is the norm for a high quality stain. Sometimes three if you are lucky. -You will not get a wide range of colors with premixed stains. -To get “custom” colors you will not be using a penetraging stain but a filming acrylic and those will be prone to peeling. -First time staining a new deck and it usually only lasts about 1-2 years. This is based on new wood not being very absorbent. Cabot solid acrylic . I’ve been using it for ten years. It does not penetrate a wood deck. You can strip it, rough up the surface, use a primer, let a new deck age, put down a seasoner on new wood. Doesn’t matter. After the winter it peels off in a bad way. Every spring you will have a major job on your hands to remove an enormous amount of peeling stain. Let dry and redo. And the same thing will occur next spring. Major peeling . Do yourself a favor. Don’t even get started with Cabot Solid Acrylic. Buy a penetrating oil based stain. We are wanting to refinish our deck after years of using Thompsons Water seal. It just peels off in the snow. We plan to use TWP because our cedar home is finished with the same. What would you recommend as a preparation for the stripper and any other preparations before applying the TWP? Prep with the Restore a Deck Stripper Kit and presure washing. Is Behr Transparent Oil-Based Waterproofing Wood Finish a film forming stain or a penetrating deck stain? I desparately want to avoid a product that will peel and/or flake off. Open to suggestions. Behr has a tendency to film and peel. Yt is also a water based stain. Have a low to ground deck which peeled badly and had to be scraped off/ Penetrating is bet but deck must breathe. what is best stain for this.? TWP stains or Armstrong Clark. Make sure you prep to remove all previous stain. How do you know which of the 2 kinds of stains you're getting? We have applied stripper and power washed but the solid staid remained. We have sanded and dry it looks ready for a penetrating stain but some boards look like there is some sort of product deep inside the wood – maybe a penetrating stain was used years ago. The deck is 40 x 16 and we don't want to replace all the cedar boards. Are we ok to use another penetrating stain? You cannot apply a semi-trans over a solid stain. Can you post a picture in our forum area so we can see? We have used stripper and powerwashed. Even with sanding all of the previous product that was used will not come out. The sanded wood looks ok dry but when wet, you can tell something is still on the boards. Are we safe using a penetrating stain or will the boards look bad? We do not want to use a heavy stain that will flake and peel and are at our wits end. Our deck is elevated and is about 40 feet by 16- we don't want to have to replace all of the cedar. Help! with new. Looked great first few weeks ..now some of the boards are oozing sap. Sap is turning white. How do I get that off and return the boards to a better look? Also, can I restain next spring for better penetration? You cannot stop sap and you cannot remove it easily. It just happens to wood. Turpentine my remove some of it. I am a facilities manager on a campus with Craftsman-style buildings. The newest building, built in 2000, has tons of exterior wood trim, wood stairs, and a huge upper deck. It was originally stained with Cabot transparent stain to show the grain. Due to construction with new, poor quality wood and/or stain failure, the wood railings were badly split and dried out within 4-5 years. Because lots of patching was needed, transparent or semi-transparent penetrating stain was not an option. For the last 10 years we've stained it with Cabot OVT solid stain. It's been stained 3 times – most recently just 2 years ago and it looks horrible and even has termites. It is way too much wood (10,000 sq. ft. building) to completely remove all the solid stain. Short of that, what are your recommendations for prep and a better solid stain product? Thanks. Probably is you cannot fix a bad solid stain job by adding more solid stain on top. In short it will continue to peel. Prep by removing all the loose paint. Try a stain stripper and pressure washing to remove what is loose. Stain with any solid stain brand. I'm torn between TWP 100 and the Cabot 4300 Wood Preservative. Are there any reviews for this new Cabot product? I can't seem to find any mention of it. Cabot is available locally whereas TWP I would have to order. Tyler, we have not been fan of Cabots since they sold the company and changed all of their formulas. Just not the same quality. 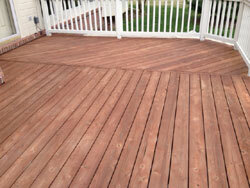 Can I change from a solid deck stain – one coat which is pretty well worn off – to a penetrating stain? From reading this site, it seems I'm in for a bad problem if I apply solid again because it will peel. What is best? Margie, you would need to 100% remove the solid stain by sanding if you want switch.